There’s nothing like piping hot pizza right out of the oven. The juicy smell of the tangy tomato sauce makes your mouth melt, while the tasty texture of the toppings delightfully dissolve as they pass through your smacking lips. Yep. There’s nothing like a piping hot pizza right out of the oven. 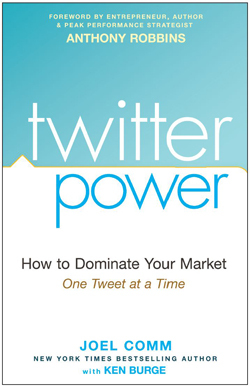 So it is with twitter power, Joel Comm’s aptly named best-selling guide to all things Twitter. It’s hot. It’s less than a year old. And it’s fast going out of date. Still, it delivers beyond what it promises and you simply must read it if you’re about to embark on a journey through Twitterville. How do I know this? My excellent friend and wise social media consultant Deb introduced me to Twitter last February. She helped me set up my first Twitter account. (AstronomyTop100.com, a volunteer outreach project that’s part of the United Nations’ International Year of Astronomy 2009 initiative, now spans across (at least) five of the seven continents and has come to involve several major institutions and astronomy clubs.) Almost immediately after my first Tweet, she handed me her copy of twitter power. I devoured its 232 pages in two days. OK, yes, I lead a boring life, but the book is exceptionally well written and easy to read. After returning her copy, I quickly bought my own. It was that good. I found Comm’s hands-on approach eminently practical. I had my background, picture and appropriate profile information up in no time. (Of course, it helped that I had Adobe’s Creative Suite at my fingertips.) In almost no time, I began accumulating followers. In a sparse field, AstronomyTop100 today has earned a fairly sizable follower list compared to other astronomy oriented twitters. And I just used the bare-bones of what Comm recommends. twitter power offers several “how-to” chapters. I’ll mention just two of them. “Getting Started the Right Way on Twitter” (Chapter 3) presents a complete soup-to-nuts instruction manual for those just getting hopping on to the Twitter Express. The penultimate chapter “Putting It All Together: A 30-Day Plan for Dominating Twitter” tells the user exactly what do to grow a follower base from scratch. Now, I don’t know if it works, but I’m about to find out (see “Great Idea. Great Design. But Will It Fly?” posted 11/13/09). So, what’s wrong with twitter power? Well, it appears to have a relatively short shelf-life. When I first read it in February, some of the pixel parameters for the background had already become out of date. When I reread it for this review, I noticed advances in Twitter itself had left portions of the book looking stale. And the verse on Third Party Tools (Chapter 10)? Let’s just say that’s best left to an on-line blog where Comm can update it in real time. Yet, don’t let those drawbacks dissuade you from getting this book. If you’re new to Twitter or even if you’ve been using it for awhile but feel you’ve not captured its full potential, twitter power belongs on your book shelf. Better yet, it belongs right next to your computer, because you’ll want to tickle your keyboard as you read it. After all, there’s only one thing that tastes better than piping hot pizza – cold pizza the next morning. Chris, Enjoyed your review of Joel Comm’s book Twitter Power. I had no idea you would appreciate it so much and even write a review when I gave the book to you earlier this year. I rolled over 5000 Twitter followers this month and I definately see that can happen for you soon. its a nice milestone and the beginning of great tweets to come. Lets make this happen – I’ve already posted a link in Twitter back to this review. p.s. lets see if we can find Joel and ask him to leave a reply here!